The Scag Tiger Cat mower put out by Scag Power Equipment is the latest addition to their strong line of powerful mowers for your lawn. With its small size but roomy deck, you can mow up to 24 acres in a single day, saving you time and money. It also has a number of features that make it a strong contender in the market. This mower is easy to maneuver and can fit into tight spaces on your lawn with its small, compact size. It comes in lengths of either 80 or 83 inches, depending on the deck size. It is 66 inches in height. The deck is available in sizes including: 60.5 inches, 64.5 inches and 73.5 inches. The deck is a Velocity Plus, which offers extreme performance and power. It gives a strong cut, no matter how fast you are driving the mower. The clippings are also widely dispersed when discharged from the deck. The driver sits on the Tiger Cat in a comfortable suspension or an optional soft-ride seat that can be adjusted with armrests. The mower is also easy to operate and the engine setup makes it simple to change the oil and do other routine maintenance. The driver can also feel safe while on the mower, as it features a foldable rollover protection system that is included on all models. There are seatbelts also installed for additional driver safety. 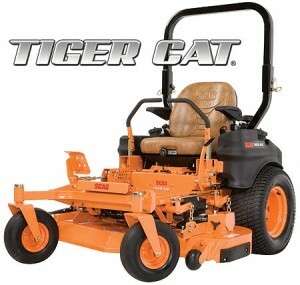 The Tiger Cat sports an engine that can deliver 27 horsepower, which can handle easy and hard to cut lawns. The engine can also be purchased in smaller sizes, including 22, 24, 25, 26, and up to 27 horsepower levels. The 22 and the 24 are Kawasaki air-cooled engines; the 25 and 27 are Kohler air-cooled engines and the 26 is a Briggs and Stratton air-cooled engine. When driving, you can reach speeds of up to 10 miles per hour in forward and 4.5 miles per hour in reverse. This gives you higher productivity without slowing you down. The engine also has an aluminum exhaust, which has a longer life than the standard steel ones. 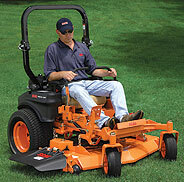 This also helps to improve the mower’s performance while decreasing the back pressure on the mower. In addition, the mower also has 10cc hydraulic pumps that have pressure relief valves installed in them. This helps to keep internal pressure even and gives the mower a smoother, more dependable performance. The engine is complemented by an Ogura GT3.5 PTO clutch brake that can give up to 250 feet pounds of torque. This makes it easier to slice through heavy lawns, even those that would tear up smaller mowers. The air gap can also be adjusted, allowing you to extend equipment life. The auxiliary canister air filter system is included on most of the models, while the 26 horsepower Briggs and Stratton features an integrated oval cartridge-style filter. These filters help to give the engine a longer life. With all of these features, the Tiger Cat is a smart investment. It has the safety, performance and durability to handle any type of lawn it runs on. This makes it a long lasting, valuable piece of lawn equipment to have in your shed. To see the latest specials and financing options, make sure to visit a Scag dealer near you. You can also purchase a variety of genuine Scag Parts online at www.ScagOEMparts.com. This entry was posted in Uncategorized and tagged Mower, Review, Scag, Tiger Cat. Bookmark the permalink.